A version of this article was originally published in our May 2016 Newsletter. I see a lot of confusion over these statements. Hopefully this will help clarify what these statements actually mean. I've added the Allergen Advisory Statements Study that was published in Sept. 2016. You may find a product labeled “Gluten-Free and Wheat-Free” that bears a GFCO gluten-free certification logo, but, it also has a “May contain traces of” statement that includes wheat. WHOA! Believe it or not, this product is in compliance with current FDA Food Allergen Labeling and consumer Protection Act of 2004 (FALCPA) labeling laws. Gluten-Free labeling supersedes voluntary advisory statements. “May Contain”, “Processed in the same facility as”, or “Processed on the same equipment as” are known as Food Allergen Advisory statements. They are voluntary and are not regulated, unlike the required “Contains” statement for food allergen ingredients. According to the FDA, companies may use advisory statements as long as they are “truthful and not misleading”. For years, the gluten-free community has been warned about using advisory statements for determining the gluten-free status. Their usefulness is diminished due to the lack of definition and regulation. Q: The ingredient list contains no gluten, but there's a statement about “Processed in the same facility as...”or “Processed on the same equipment as...” what do you do? A: That’s a voluntary advisory statement designed for people with IgE allergies. Many companies use it as a “CYA”. No meaning for celiacs. A group of RD's determined that it would reckless of them to suggest that statement should be used to determine gluten-free status. If you have an IgE (anaphylactic reaction), you need to think about it. Check out this example of Aldi's Baker's Corner Instant Pudding. After the ingredient list, you'll see a statement that reads: "MANUFACTURED IN A FACILITY THAT USES TREE NUTS, SOY, MILK, AND WHEAT." Update: While it may still be gluten-free, this product is no longer labeled gluten-free. I reached out to Aldi's to ask about this product. On May 15th, 2015, the Quality Control Supervisor from Subco Foods in Sheboygan, WI (the company that does the pudding) called me. I asked about the production lines for this product - did they run any gluten products on this line? Tamela’s answer was very thorough! The pudding lines are dedicated - only pudding is done on them - nothing else - no gluten. They test raw materials for gluten coming into the plant - they test during production and they also send samples out to a private lab for finished product testing. Between pudding flavor runs (vanilla/chocolate/etc), they follow a strict teardown and cleaning process. They are very serious about food allergens. Also the pudding lines are isolated from their jello lines. She said they do not want dairy getting into the jello lines. So, what do we do with products like this? Call the manufacturer to ask questions. Ask about the facilities, the production lines, and their policies and procedures for allergen handling. If they do not answer the questions to your satisfaction, find another manufacturer with a similar product that does meet your needs. Building upon their 2016 paper [see below], Tricia Thompson, Amy Keller, and Trisha B. Lyons published "When foods contain both a gluten-free claim and an allergen advisory statement for wheat: should consumers be concerned?" on March 26, 2018 in the European Journal of Clinical Nutrition. This retrospective database analysis included a total of 328 gluten-free labeled products previously tested for gluten content by Gluten-Free Watchdog. 14/328 (4%) labeled gluten-free products contained a level of gluten of at least 20 p.p.m. Of these products, 12/14 (86%) did not include an allergen advisory statement for wheat or gluten on product packaging. The 14 products that contained a level of gluten of at least 20 p.p.m. included two beverages, one spice, and 11 grain-based foods. Of the grain-based foods, 5/11 (45%) were oat products. 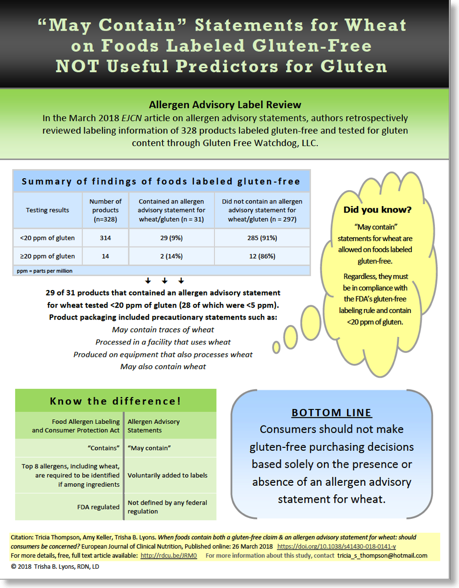 31/328 (9%) foods tested for gluten included an allergen advisory statement for wheat or gluten on product packaging. Three of these 31 (10%) products contained quantiﬁable gluten of at least 5 p.p.m. On the basis of this retrospective data analysis, the use of allergen advisory statements (regardless of type) on foods labeled gluten-free was not indicative that a food was out of compliance with the gluten-free label ing rule. Due to the current lack of federal regulations for allergen advisory statements, consumers with celiac disease and other gluten-related disorders should not make gluten-free purchasing decisions based solely on the presence or absence of an allergen advisory statement for wheat. One issue that may be causing mistrust among gluten-free consumers when products contain both a gluten-free claim and a precautionary statement for wheat is the lack of required testing for foods labeled gluten-free. In the US,while foods must contain <20 p.p.m. of gluten to be labeled gluten-free, testing is not included in the FDA’s codiﬁed rule. Increased education is needed to advise consumers that a gluten-free claim applies to gluten that may be in a product due to ingredients and cross-contact. Under the gluten-free labeling rule, a gluten-free claim on product packaging means the food must comply with all criteria of the rule,including containing <20 p.p.m. of gluten. This is true regardless of the presence or absence of an allergen advisory statement for wheat . 4/45 (9%) products that DID include an allergen advisory statement for wheat or gluten on product packaging contained quantifiable gluten. 52/384 (14%) products that did NOT include an allergen advisory statement for wheat or gluten on product packaging contained quantifiable gluten. The FDA should strongly consider regulating allergen advisory statements, especially in light of the Food Safety Modernization Act. 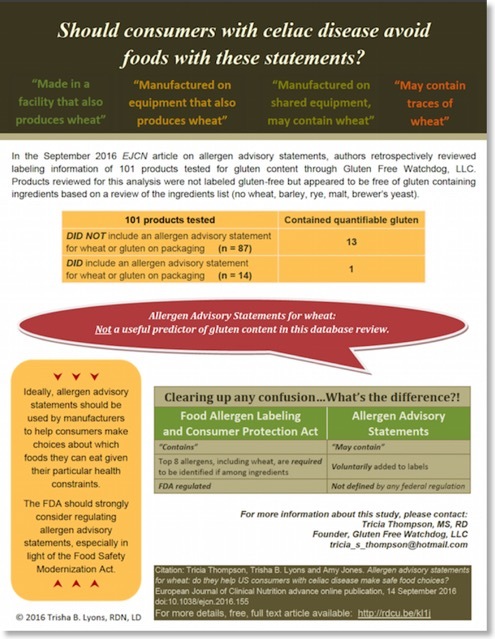 Tricia Thompson, Trisha B. Lyons, and Amy Jones analyzed allergen advisory statements of 101 products previously tested for gluten content by Gluten-Free Watchdog. These products were not labeled gluten-free, however the ingredient list did not include any gluten containing ingredients (no wheat, barley, rye, malt, or brewers yeast). On September 14th 2016, they published Allergen Advisory Statements for Wheat: NOT a Useful Predictor of Gluten Content. In this database review, precautionary labeling for wheat or gluten on products not labeled gluten-free but appearing to be free of gluten-containing ingredients was NOT a useful predictor of gluten content. In some cases, consumer reliance on precautionary statements for wheat or gluten could have resulted in choosing a product contaminated with gluten. •	87/101 (86%) products tested for gluten did NOT include an allergen advisory statement for wheat or gluten on product packaging. •	Fourteen products (14%) tested for gluten DID include an allergen advisory statement for wheat or gluten on product packaging. •	Of the 87 products that did NOT include an advisory statement, 13 (15%) contained quantifiable gluten at or above 5 ppm including 4 products (5%) that tested at or above 20 ppm of gluten. •	Of the 14 products that DID include an advisory statement, only 1 (7%) contained quantifiable gluten at or above 5 ppm. On the basis of this analysis, the current use of allergen advisory statements for wheat or gluten are not useful predictors of whether or not a single or multi-ingredient food product contains 20 or more p.p.m. of gluten. Precautionary statements should be regulated and standardized so that they are helpful to the consumer. In terms of foods labeled gluten-free, consumers are advised to trust the label regardless of allergen advisory statements for wheat or gluten. This is due to the gluten-free labeling rule applying to both gluten in ingredients and gluten that may be found in a product due to cross contact. However, when it comes to foods not labeled gluten-free but appearing to be "gluten-free" based on ingredients, there are no established guidelines for individuals with celiac disease on whether they should avoid products with allergen advisory statements for wheat or gluten. 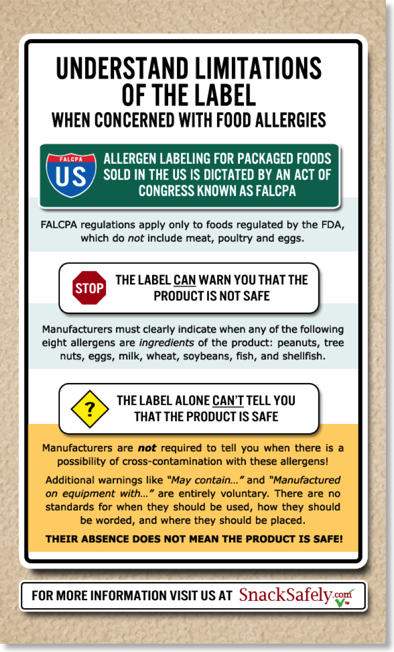 Increased education is also required to let consumers know that FALCPA includes ingredients only and does not include allergens that may be in a product unintentionally due to cross contact. Increased education is also needed to let consumers know that a gluten-free label applies to gluten that may be in a product due to ingredients and cross contact and that regardless of the source of gluten the product must contain less than 20 p.p.m. gluten. To learn more about this confusing matter, please watch these excellent Q&A videos from Gluten-Free Watchdog. Include a Contains Statement for Wheat? Include a May Contain Statement for Wheat? Allergic Living "'May Contains’ on Food Labels: What You Need to Know"
“‘May Contains’ on Food Labels: What You Need to Know"
“Advisory labels or “may contains” (also called precautionary warnings) alert customers that traces of an allergenic food might unintentionally have wound up in a packaged food. – The wording of the warning label does not give an indication as to the risk of the allergen being present. Snack Safely - "Understand the Limitations of the Label"
10/20/16 - Updated to include "Allergen advisory statements for wheat: do they help US consumers with celiac disease make safe food choices?"